First I made a two layered round cake and sandwiched with butter icing. The first layer cake is raspberry flavur in pink and the other layer is pineapple flavur in green. About 3 days before I made the red bow parts with fondant and left it to dry. Then the 3rd day once the two bow parts are dried and hard I attached the middle and left it dry again. After three days then i cut little dots and put on the red bow. Once I sandwiched the cake with butter icing I covered the cake with white fondant and using bead cutter I finished the around. 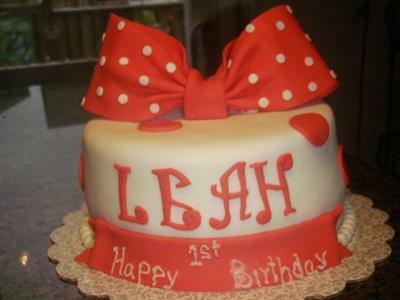 Using leftover red fondant, I cut circles and decorated them and also used a piece of red fondant and wrote "Happy 1st Birthday" as requested by the customer.